Are you near a window? Good. Is it near a road? Okay, great. Look out that window for me. If your're looking at most American roads or parking lots, chances are disappointingly good that the sea of cars you're observing, face smushed against the glass, is largely composed of neutral colors. Silvers, whites, greys, beiges, with the occasional mix of deep blues and maroons and darker reds. It's not just what's happening outside of your window, either— a 2011 study by DuPont found that a staggering 82% of cars are non-color colors: Whites, greys, silvers, blacks, beiges. See that grid above? Those are all new cars displayed at this year's LA Auto Show, where new paint technology and more aggressive marketing has led automakers to attempt brighter and better colors. I told our excellent photographer Brian Williams (not that one) to go out and take some nice detail shots of cars with interesting, bold colors for me. What he came back with were the images seen above, which work best all together in that big grid. Aside from being excellent photos of automobile design details, look at the colors on display today. No one's being timid anymore, and that's great. There are vivid greens, lush reds, vibrant yellows, green clovers, blue diamonds and all sorts of great hues. I even like the weirder ones — for some reason that salmony/pepto-bismal orangish color of the Prius C always catches my eye. I don't even mind Chrysler's lurid purple — I'd rather risk a bit of vulgarity over blandness any day. "The saturation and depth of color was a lot better because they didn't have a lot of the specs that we have now-adhesion testing, gravel chip testing, engineering tests. If I had the exact same pigmentation of a highly saturated color from the '60s … that paint would be brittle." Modern paints that last for more than 10 years without turning into something you'd see in the dermatology section of a medical textbook have come at the price of less vivid, saturated colors, especially for metallics, where the tiny mica and aluminum flakes have a desaturating effect. Recent advances are changing this, allowing for saturated, long-lasting colors of the sort we're starting to see now. Conceptually, manufacturers have been more likely to provide vivid colors for small, economy cars and very sporty cars than anything else. For example, the new VW Beetle and Fiat 500s have offered yellows and bright greens and reds since they were introduced, and muscle cars like the new Camaro come in an appropriately skittle-colored array of options. In fact, there's an entire group dedicated just to following trends and patterns in the global colorsphere, called the Color Marketing Group. 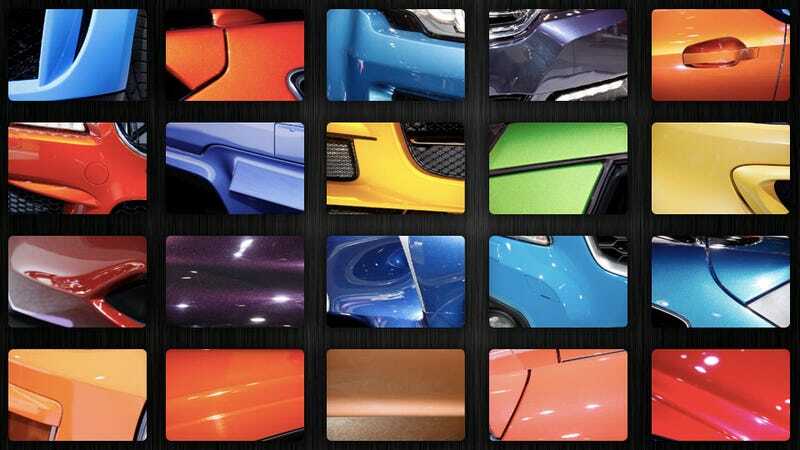 Other firms very interested in car colors, like BASF, have released reports suggesting that rich earthtones and other natural-inspired colors will dominate the near future. I'm hoping people actually choose more of these engaging colors when they go car shopping. I'm more than willing to give up the ease of finding my bright yellow car in a full parking lot if it means that the general car-scape of our lives takes on a nice rainbow injection. Oh, and for fun, down there in Kinja let's see who can guess what's what? We'll identify them with cartesian coordinates, to be fancy. Top left is 1,1. Have at it!